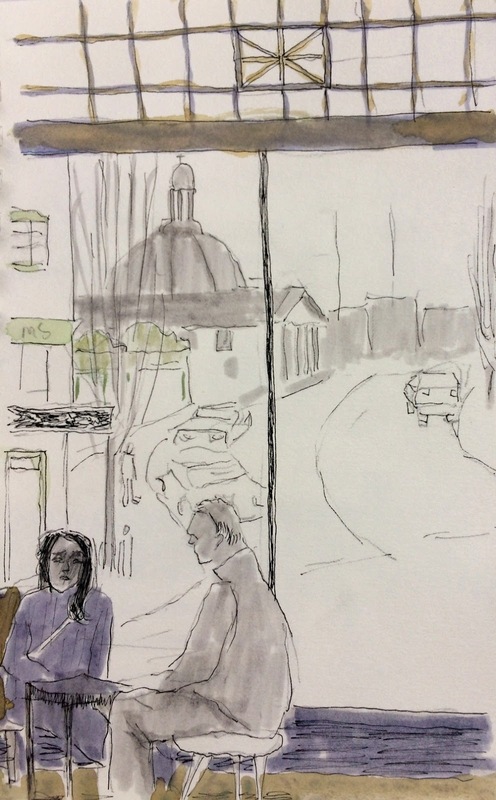 This week I did an Urban Sketcher double-header. The prospect of a road trip to Gig Harbor on Thursday and public transportation to Capitol Hill on Friday appealed to my sense of adventure. I challenged myself to 6 drawings in 2 days, game on. On the way to the Thursday meet up with Urban Sketchers Tacoma-Gig Harbor, when treated to a full on view of Mt Rainier clear and detailed, I was ready to start sketching immediately except for the fact since I was driving 60 mph on the freeway, I couldn’t. The immense blue mountain covered with a sparkling snow cap disappeared soon enough. 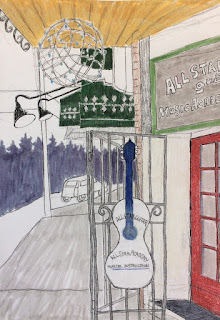 Before I knew it, the Narrows Bridge in all it’s glory opened up and led me to the Gig Harbor destination, All Star Guitar. 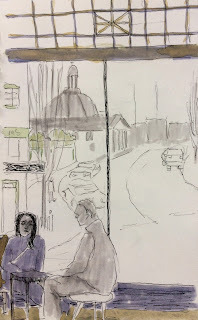 Impressed with the front door and sign the minute I rounded the corner, I stood and sketched it. The colors and whimsy of the sign, the text and twinkling globe light fixture high above attracted my bohemian nature. The street with distant evergreens in silhouette added rustic charm to the experience. 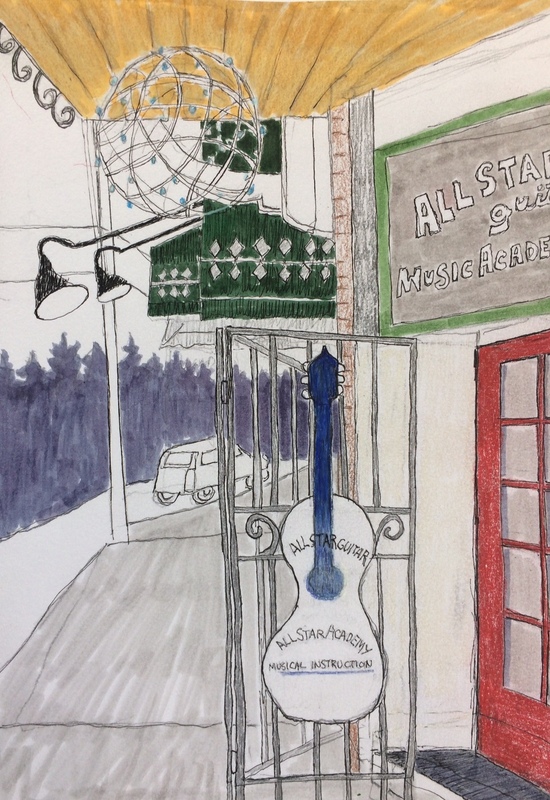 Located on the second floor of a vintage building in downtown Gig Harbor, All Star Guitar is the town’s music center. 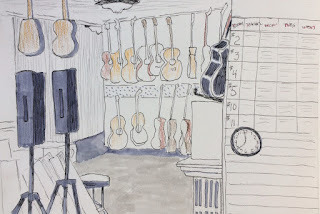 Guitars line the walls and hang from the ceilings. Drum sets and other music paraphernalia fill the space and music instruction rooms line the hallways.The row of guitars and teaching schedule begged a sketch as did the man with a walking stick waiting for his repaired guitar. He really wanted it back, said he had a hard time being without. I liked him and the fancy red electric guitar sitting next to him. Two necked guitars are handy for very skillful guitarists. 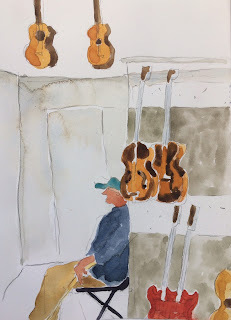 Waiting for repair surrounded by guitars. 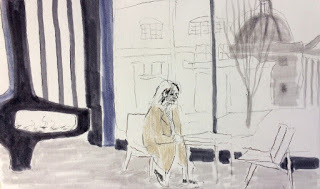 Friday morning I hopped on bus #3 and disembarked at Pine and 3rd. It was raining so I popped open my umbrella as I walked up the steep incline to Starbucks Reserve Roastery and Tasting Room. When I arrived at the Roastery to meet with the Urban Sketchers Seattle Ad Hoc group, I discovered my normal brew was not available as they only sell premium coffee. 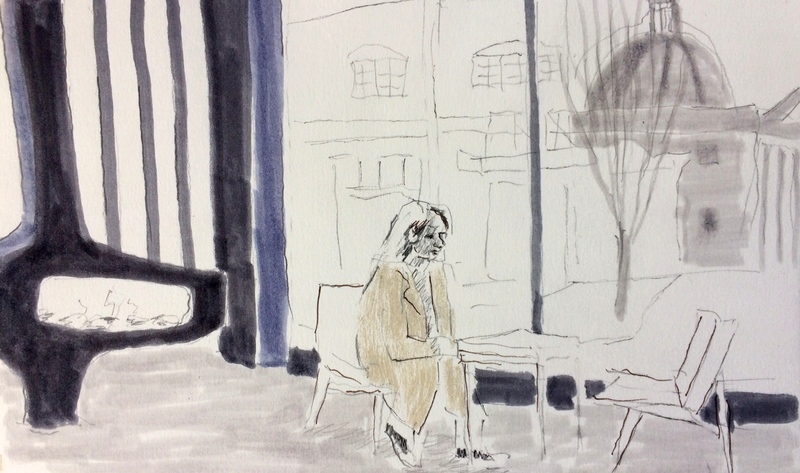 The barista’s recommendation was $2.50 more than I usually pay but that’s OK because it was good, and I did appreciate sketching at the Reserve. Customers sitting on the custom designed wooden bar stools looked comfortable and sociable. The beautifully preserved window design frames an urban landscape lined with domes, pediments and painted brick facades distinctive with the patina of age. 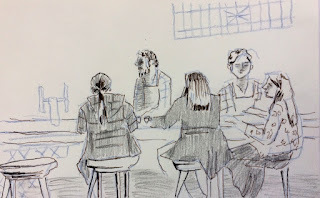 The employees were friendly and welcoming to our sketching group. I’m glad Starbucks decided to use and restore the building. On my bus ride I observed row after row of old buildings ready for demolition. Surrounded by chain link fences, they looked forlorn. It will be a sad day if all the buildings with character turn to rubble. I have great admiration for developers who repair and restore buildings of historical interest. 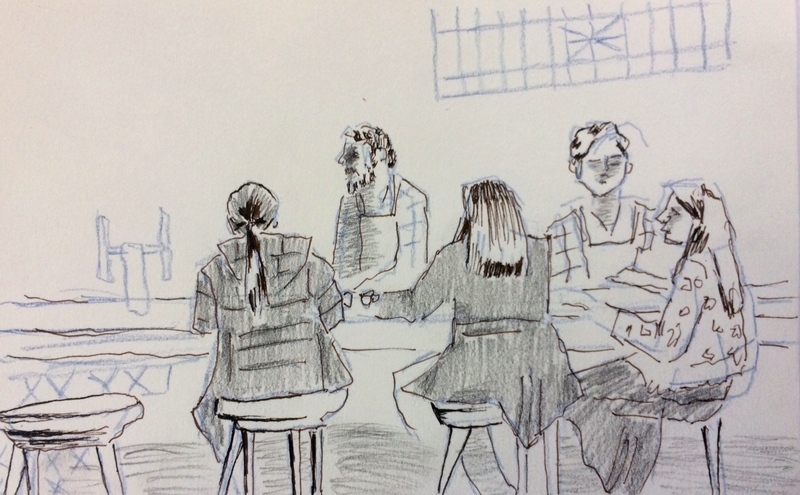 It was fun sketching with you at the Roastery! You've had a prolific week!